Jefry Leonal Paulino Marte. Originally signed as international free agent with the Mets, July 2, 2007... Signed by scouts Ismael Crus, Juan Mercado and Marciano Alvarez. Made first career Opening Day roster in his third big league season and second with Angels...During three different stints at the big league level, appeared defensively at first base (28 G), third (10 G) & left field (3 G) ... Went 2-for-6 (.333) with a double and three RBI as a pinch hitter ... Split season with Triple-A Salt Lake...Posted a .319 (36/113) average over fi nal 27 minor league games. Aft er beginning the season with Triple-A Salt Lake, went on to make two diff erent sti nts for Angels...Surpassed rookie marks in games, hits, doubles, home runs, RBI, runs scored, walks and OBP...Was the fourth Halo to hit 15 or more home runs during their sophomore season since 2011, joining C.J. Cron (16 HR in 2015), Mike Trout (30 HR in 2012) and Mark Trumbo (29 in 2011)...Hit fi rst career grand slam Sept. 27 vs. Oakland...Was the fi rst grand slam by a Halo left fi elder since Mike Trout's April 20, 2013...Appeared defensively at fi rst base (29 G), left fi eld (27 G) and third base (22 G)...Prior to 2016, had never appeared in left fi eld at any point during professional career. Spent a majority of the season with Triple-A Toledo and hit .275 (98/357) with 25 doubles, three triples, 15 home runs and 65 RBIs in 95 games... Led the Internati onal League with a .487 slugging percentage. Named the International League Player of the Month and Tigers Player of the Month for June aft er batting .317 (33/104) with eight home runs and 25 RBI... Led the IL in home runs, RBI, extra-base hits (16) and total bases (65)... Named to the International League All-Star team. Had contract purchased by Detroit July 4... Made Major League debut July 5 vs. Toronto, going 0-for-1 after entering the game as a pinch hitter... During first big league start, July 8, collected first big league hit (2B), home run and RBI. Across two Major League stints, hit .213 (17/80) with four doubles, four home runs and 11 RBIs... Was the eighth Tiger rookie in franchise history to hit four or more home runs in a season and play in less than 35 games. In 2014, spent the entire season with Oakland's Double-A Midland... Was part of a triple play turned Aug. 8 vs. Springfield... Signed with the Tigers as a minor league free agent following the season... Participated in the Dominican Winter League. Batted .344 (34/91) vs. left-handed pitching in 2013 with Double-A Midland... Played with the Toros del Este in the Dominican Winter League... Acquired by the A's from the Mets, Dec. 18, 2012 in exchange for OF Colin Cowgill. Made his Double-A debut with Binghamton and hit .251 in 129 games...had career-highs in runs (61), home runs (9), RBI (58) and walks (43)...led Binghamton in RBI, was second in games, at bats (462) and runs and tied for second in home runs...was named to the Eastern League Midseason All-Star team...batted .336 (42-for-125) against left-handed pitching compared to .220 (74-for-337) against right-handers...hit six home runs in 125 at bats against lefties (one per 20.8 at bats) and three in 337 at bats against righties (one per 112.3 at bats)...had a .560 slugging percentage against lefties compared to .294 against righties...hit .280 at home compared to .222 on the road...had a .314 batting average with runners in scoring position...hit .216 when leading off an inning...was 8-for 17 (.471) with four walks with the bases loaded...batted .358 with no home runs in 19 games in April, hit .249 with eight home runs in 80 games from May 1 to July 31 and then batted .188 with one home run over his final 30 games...committed 15 errors in 107 games at third base for a career-best .939 fielding percentage...also appeared in five games at first base, batted .208 in 14 games as the designated hitter and was 3-for-3 with a double and two RBI as a pinch hitter...hit in every spot in the order except first, second and eighth...hit .295 in 38 games batting fourth but had a .191 average in 29 games from the three spot...played for Toros del Este in the Dominican Winter League following the season and hit .267 with a home run and five RBI in eight games. Batted .248 with seven home runs and 55 RBI in 131 games with Single-A St. Lucie...had career highs in games, hits (120), doubles (22) and stolen bases (14)...was caught stealing just twice for a stolen base percentage of 87.5...finished second on his team in games, at bats (483), doubles, RBI and walks (41)...hit .253 against left-handed pitching compared to .246 against right-handers...had a .283 batting average, five home runs and 32 RBI in 68 games in the first half...then hit .210 with two home runs and 23 RBI in 63 games the second half...batted .302 in the eighth inning or later...hit .156 with runners in scoring position and two outs...led Florida State League third baseman with 28 errors (.902 fielding percentage)...appeared exclusively at third base on defense (122)...also batted .278 in nine games at designated hitter...had a .273 batting average in 88 games from the four spot in the order...also hit fifth (26 games), third (16) and second (1)...got off to a strong start, batting .321 with four home runs and 16 RBI in the month of April...that included a season-best seven-game hitting streak from April 15 to 22 (10-for-27, .370)...had his only two homer game of the season April 21 at Charlotte...also drove in a season-high three runs in that contest...had his first of two two-steal games April 29 against Bradenton (also June 7 at Palm Beach)...hit his fifth home run of the season May 1 but would homer just twice over his final 107 games...including an 86-game homerless streak from May 2 to Aug. 10...had a season-high three hits May 17 against Brevard and May 23 at Daytona...that put his batting average to .297 but he went 11-for-59 (.186) with no extra base hits and one RBI over his next 16 games...batted .367 over a 14-game stretch from June 11 to 28...played in the All-Star Futures Game for the World Team July 10 at Arizona and went 0-for-1...matched his season-high with a seven-game hitting streak from July 14 to 20 (10-for-28, .357)...went 4-for-53 (.075) over a 14-game stretch from July 21 to Aug. 4...finished July with a .184 average...went 6-for-23 (.261) with a double, home run and two RBI in six postseason games for St. Lucie...played for Peoria in the Arizona Fall League following the season...hit .333 with four home runs and 18 RBI in 22 games...added 12 walks for a .436 on-base percentage, which ranked sixth in the AFL. Spent the entire season at Single-A Savannah but appeared in just 82 games due to two stints on the disabled list...hit .264 with six home runs and 44 RBI...his average included a .268 mark and five home runs against right-handed pitching compared to .253 against left-handers...hit five of his six home runs on the road...batted .189 in April, .248 in May, .237 in June and .354 in July...committed 25 errors in 80 games at third base for a .892 fielding percentage...also went 3-for-9 (.333) in two games as the designated hitter...hit in every spot in the order from third through sixth...batted .282 in 47 games hitting clean-up...began the season on the disabled list with a strained left hamstring...was reinstated April 21 and went 1-for-19 (.053) over his first five games...then compiled a season-best eight-game hitting streak from April 26 to May 4 (11-for-30, .367)...capped the streak by scoring three runs May 4 at Delmarva but also committed three errors...went 12-for-70 (.171) over a 17-game stretch from May 5 to 23...then had his first of eight three-hit games May 24 against Kannapolis...matched his season high with an eight-game hitting streak from May 26 to June 2 (13-for-32, .406)...had season highs in runs (3), hits (3) and doubles (2) June 14 against Rome...had a third eight-game hitting streak from July 5 to 12 (15-for-32, .468)...went 3-for-5 with three runs, a triple, two home runs and four RBI July 10 at Asheville...had back-to-back three-hit games July 17 and 18 against Greenville...was placed on the disabled list Aug. 4 with a strained left hamstring and missed the remainder of the season. Spent his first full season with Single-A Savannah and batted .233 with six home runs and 41 RBI in 123 games...had career highs in at bats (485), triples (6), hit by pitches (8) and strikeouts (117)...batted .243 with all six of his home runs against right-handed pitching compared to .202 against left-handers...hit five of his six home runs on the road...batted .337 in the first inning...committed 49 errors in 119 games at third base for a .856 fielding percentage...led South Atlantic League third basemen in errors...also appeared in one game at shortstop and went 1-for-7 (.143) in two games as the designated hitter...hit in every spot in the order except fourth and eighth...saw his most action with 64 games batting second...had his first of seven three-hit games April 11 against Augusta...finished April with a .267 batting average but then hit .153 in May...went 3-for-48 (.063) over a 14-game stretch from May 11 to 25...had his lone two-homer game of the season May 29 at Ashville...hit .282 in June, which was his best single-month average in 2009...had a season-best eight-game hitting streak from July 8 to 16 (12-for-31, .387). Made his professional debut with the Mets affiliate in the Gulf Coast Rookie League, batting .325 with four home runs and 24 RBI in 44 games...was the Mets Sterling Award winner for their GCL club...ranked second in the GCL in slugging (.532), fourth in extra base hits (21), tied for fifth in doubles (14) and sixth in batting...hit .338 against right-handed pitching, .250 against left-handers...appeared in 40 games on defense, all at third base. January 2, 2019 Toros del Este placed 1B Jefry Marte on the reserve list. December 27, 2018 1B Jefry Marte assigned to Toros del Este. December 20, 2018 Toros del Este placed 1B Jefry Marte on the reserve list. November 13, 2018 1B Jefry Marte assigned to Toros del Este. November 2, 2018 1B Jefry Marte elected free agency. November 2, 2018 Los Angeles Angels sent 1B Jefry Marte outright to Salt Lake Bees. July 5, 2018 Los Angeles Angels activated 1B Jefry Marte from the 10-day disabled list. 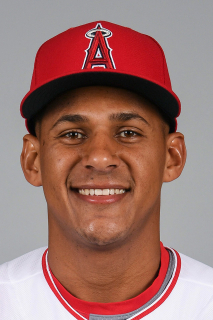 June 29, 2018 Los Angeles Angels sent 1B Jefry Marte on a rehab assignment to Inland Empire 66ers. June 12, 2018 Los Angeles Angels placed 1B Jefry Marte on the 10-day disabled list. Left wrist sprain. October 2, 2017 Los Angeles Angels activated 1B Jefry Marte from the 10-day disabled list. September 8, 2017 Los Angeles Angels placed 1B Jefry Marte on the 10-day disabled list retroactive to September 5, 2017. Left foot fracture. September 4, 2017 Los Angeles Angels recalled 1B Jefry Marte from Salt Lake Bees. August 25, 2017 Los Angeles Angels optioned 1B Jefry Marte to Salt Lake Bees. August 10, 2017 Los Angeles Angels recalled Jefry Marte from Salt Lake Bees. July 1, 2017 Los Angeles Angels optioned 1B Jefry Marte to Salt Lake Bees. June 26, 2017 Los Angeles Angels recalled Jefry Marte from Salt Lake Bees. June 3, 2017 Los Angeles Angels optioned 1B Jefry Marte to Salt Lake Bees. May 15, 2017 Los Angeles Angels recalled Jefry Marte from Salt Lake Bees. May 14, 2017 Los Angeles Angels optioned 1B Jefry Marte to Salt Lake Bees. May 31, 2016 Los Angeles Angels recalled Jefry Marte from Salt Lake Bees. May 20, 2016 Los Angeles Angels optioned 3B Jefry Marte to Salt Lake Bees. May 13, 2016 Los Angeles Angels recalled Jefry Marte from Salt Lake Bees. April 2, 2016 Los Angeles Angels optioned 3B Jefry Marte to Salt Lake Bees. January 27, 2016 Detroit Tigers traded 3B Jefry Marte to Los Angeles Angels for 2B Kody Eaves. January 20, 2016 Detroit Tigers designated Jefry Marte for assignment. September 8, 2015 Detroit Tigers recalled 1B Jefry Marte from Toledo Mud Hens. August 19, 2015 Detroit Tigers optioned 3B Jefry Marte to Toledo Mud Hens. July 4, 2015 Detroit Tigers selected the contract of Jefry Marte from Toledo Mud Hens. November 20, 2014 Detroit Tigers signed free agent 3B Jefry Marte to a minor league contract and invited him to spring training. November 20, 2014 3B Jefry Marte assigned to Toledo Mud Hens. September 17, 2014 Midland RockHounds activated 3B Jefry Marte from the 7-day disabled list. July 4, 2013 Midland RockHounds activated 3B Jefry Marte from the 7-day disabled list. June 20, 2013 Midland RockHounds sent 3B Jefry Marte on a rehab assignment to AZL Athletics. June 2, 2013 Midland RockHounds placed 3B Jefry Marte on the 7-day disabled list. May 31, 2013 Midland RockHounds activated 3B Jefry Marte from the 7-day disabled list. December 18, 2012 Oakland Athletics traded CF Collin Cowgill to New York Mets for 3B Jefry Marte. December 18, 2012 3B Jefry Marte assigned to Midland RockHounds. October 14, 2012 1B Jefry Marte assigned to Toros del Este. April 5, 2012 3B Jefry Marte assigned to Binghamton Mets from St. Lucie Mets. April 5, 2012 Binghamton Mets activated 3B Jefry Marte. March 6, 2012 3B Jefry Marte assigned to New York Mets. March 6, 2012 Jefry Marte roster status changed by New York Mets. July 11, 2011 Jefry Marte roster status changed by St. Lucie Mets. July 9, 2011 St. Lucie Mets placed 3B Jefry Marte on the temporarily inactive list. April 7, 2011 3B Jefry Marte assigned to St. Lucie Mets from Savannah Sand Gnats. March 21, 2011 3B Jefry Marte assigned to New York Mets. September 21, 2010 Jefry Marte roster status changed by Savannah Sand Gnats. August 4, 2010 Savannah Sand Gnats placed 3B Jefry Marte on the 7-day disabled list. Strained left hamstring. April 21, 2010 Savannah Sand Gnats activated 3B Jefry Marte from the 7-day disabled list. April 10, 2010 Savannah Sand Gnats placed 3B Jefry Marte on the 7-day disabled list retroactive to April 9, 2010. October 16, 2009 3B Jefry Marte assigned to Toros del Este. August 31, 2009 Savannah Sand Gnats activated 3B Jefry Marte.